Cartoonists Pran Kumar Sharma, Cartoonist Pran, Creator of Chacha Chaudhary, sabu and other character died on Wednesday. Pran was the man behind the famous comic series Chacha Chaudhury. His others famous characters included cartoons like Sabu, Shrimatiji, Pinki, Billoo, Raman, Channie Chachi and many more. Pran succumbed to cancer early on Wednesday morning at a hospital in Gurgaon, according to his publisher Diamond Comics. He was 75. "Pran passed away at 9 AM at the Medanta hospital. He had been suffering from cancer of the intestine for the past eight months. He is survived by a son and a daughter," Gulshan Rai, Publisher, Diamond Comics, said. Born in Kasur, near Lahore in Pakistan in 1938, Pran began his career in 1960 as a cartoonist for the Delhi-based newspaper Milap with comic strip Daabu In 1969, Pran sketched Chacha Chaudhary for the Hindi magazine Lotpot, which made him famous. Prime Minister Narendra Modi took to Twitter to express his grief over the passing away of the cartoonist. 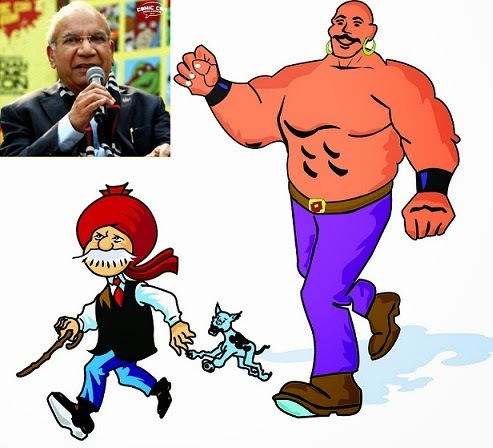 Comic book character Chacha Chaudhary's creator Pran Kumar Sharma was a "versatile cartoonist who brought smiles on the faces of people", Prime Minister Narendra Modi said on Wednesday, expressing grief at his demise. "PM described Pran Kumar Sharma as a versatile cartoonist who brought smiles on the faces of people through his rich work," the official Twitter handle of the PMO said.